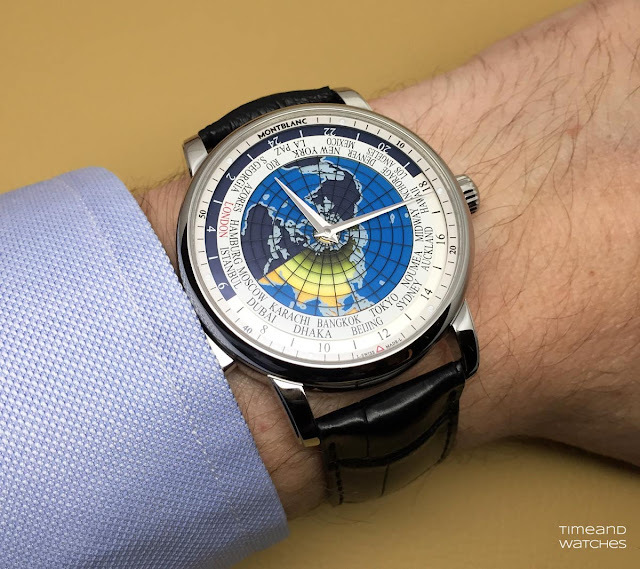 In 2015, Montblanc introduced an attractive and easy-to-use worldtime complication with the Heritage Spirit Orbis Terrarum model (we wrote about it here). 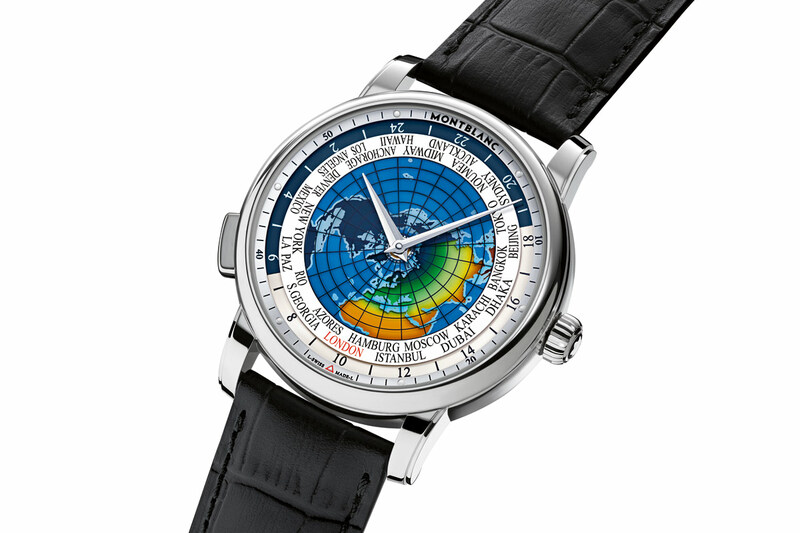 The Montblanc 4810 Orbis Terrarum (from the Latin for "globe" and "earth") is characterised by an eye-catching dial constructed of multiple layers, starting with the main sapphire crystal disc that displays the continents as viewed from the North Pole and the names of the 24 cities representing the different timezones. The continents are cut out from the rest of the disc that displays the oceans in a light blue colour. A second sapphire crystal disc indicates the passing of day and night with a dark blue for the night and a gradient of yellow and green for the day. This disc also includes the 24-hour ring that indicates the different times in the 24 cities. To adjust the time, the local time city first needs to be positioned in front of the red triangle at 6 o’clock via the pusher at 8 o’clock. 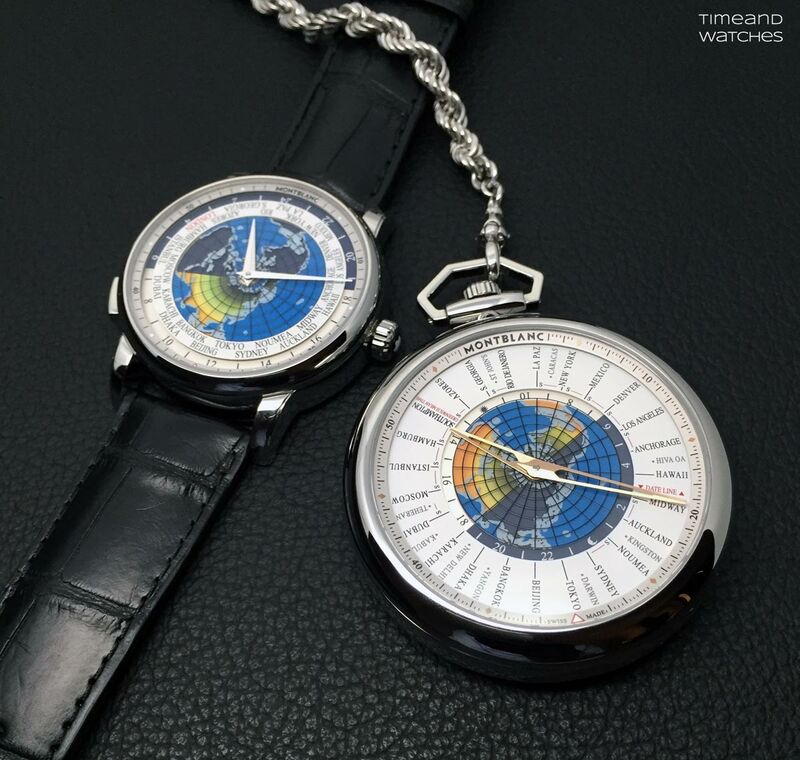 Then the hours and minutes can be adjusted through the crown to set the correct local time. 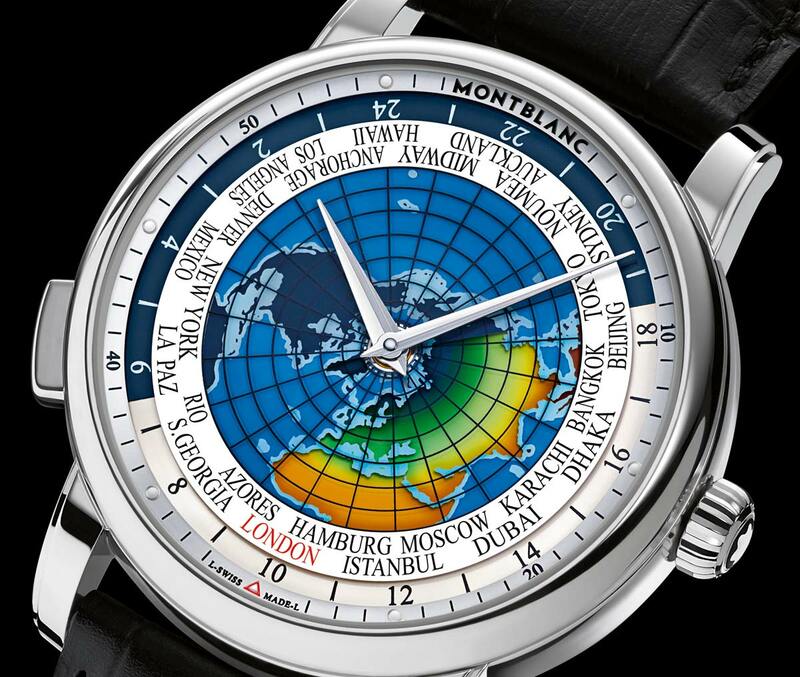 Once this is completed, the time in all 24 timezones will be simultaneously displayed around the dial. When travelling to another timezone, the new destination city simply needs to be aligned at 6 o’clock using the pusher at 8 o’clock. The dial is framed by a 43 mm (compared to 41 mm of the Heritage Spirit Orbis Terrarum version) stainless steel case with a thickness of 11.87 mm and rounded lugs to comfortably adapt to the wrist. Inside, the in-house self-winding Calibre MB 29.20 beats at 4 Hz (28,800 vph) with a power reserve of 42 hours. The Montblanc 4810 Orbis Terrarum (ref. 115071) has a price of Euro 5,890. 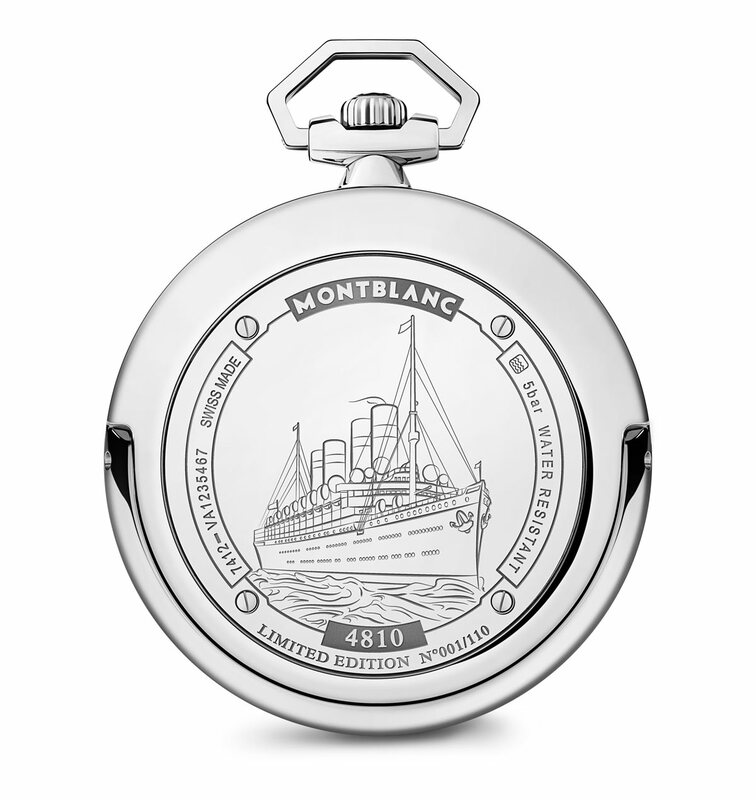 The same world timer function is implemented by Montblanc in the 4810 Orbis Terrarum Pocket Watch 110 Years Edition featuring a 53 mm Lépine style steel case which leaves plenty of room for the 24 city names. The size of the disk depicting the globe and the names of the cities is much larger in this pocket watch than in the wristwatch, making it more challenging to turn. The Calibre MB 29.20 is, however, strong enough to support the extra size and weight, making it possible to present this beautiful variation. SIHH 2016: Montblanc - 4810 Orbis Terrarum. In 2015, Montblanc introduced an attractive and easy to use worldtime complication with the Heritage Spirit Orbis Terrarum model. 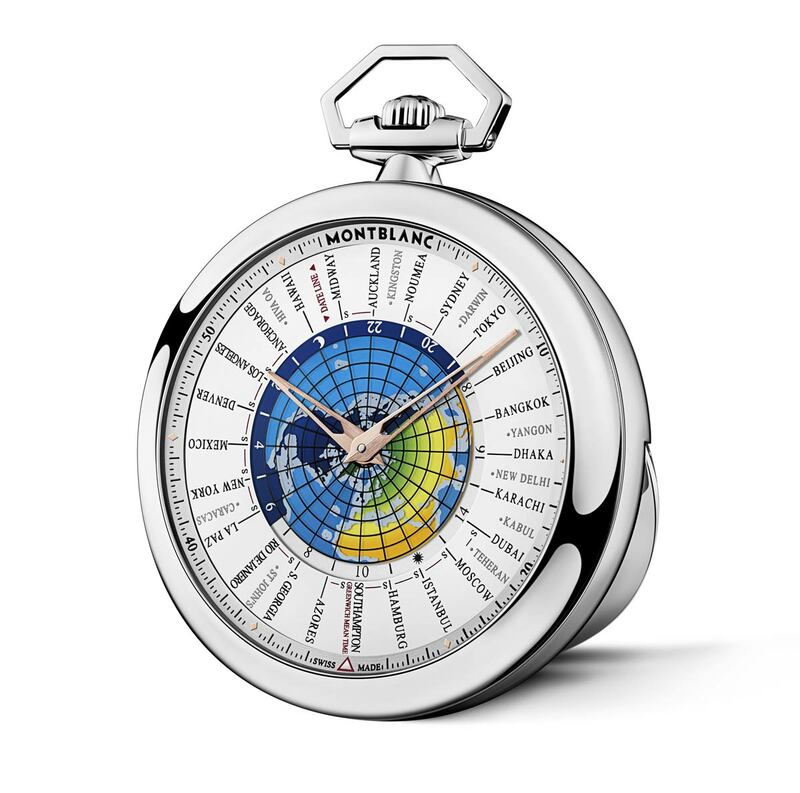 The same function, telling the time in 24 timezones, is now presented in a new model which is part of the 4810 collection, the Montblanc 4810 Orbis Terrarum. 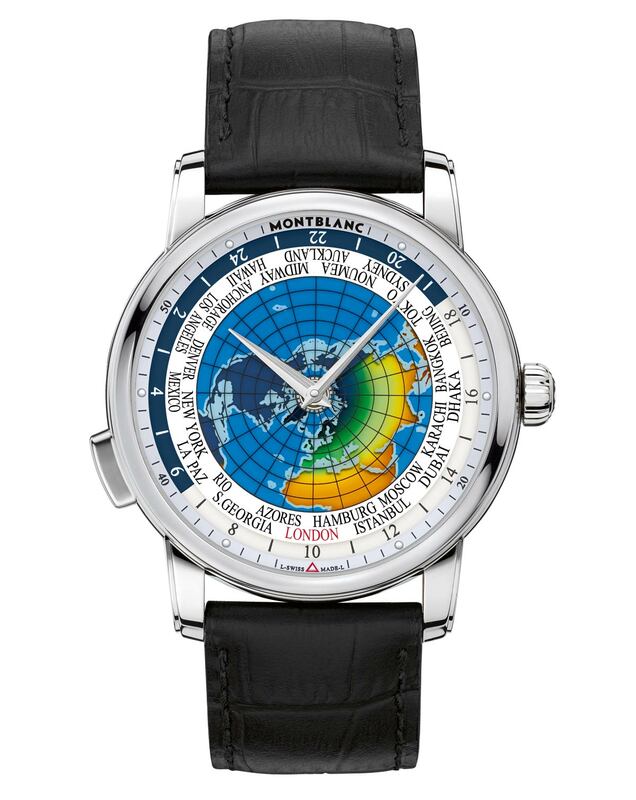 The Montblanc 4810 Orbis Terrarum (ref. 115071) has a price of Euro 5,890. The Montblanc 4810 Orbis Terrarum Pocket Watch 110 Years Edition (ref. 114928) has a price of Euro 8,500.